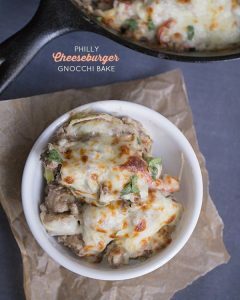 Thirty Minute Philly Cheeseburger Gnocchi Bake: Low fat cream cheese, lean ground beef and whole wheat gnocchi come together to create this quick and easy one pan skillet dinner. Oh so you want a cheeseburger? Who the heck doesn’t want a cheeseburger? One time I ordered a burger without cheese. The response, along with a puzzled look – what’s a burger without cheese? I should have used the witty skills and replied “a hamburger” but I didn’t. Instead, I replied with some lame answer, something about not wanting to eat dairy during that particular time. Yawn. 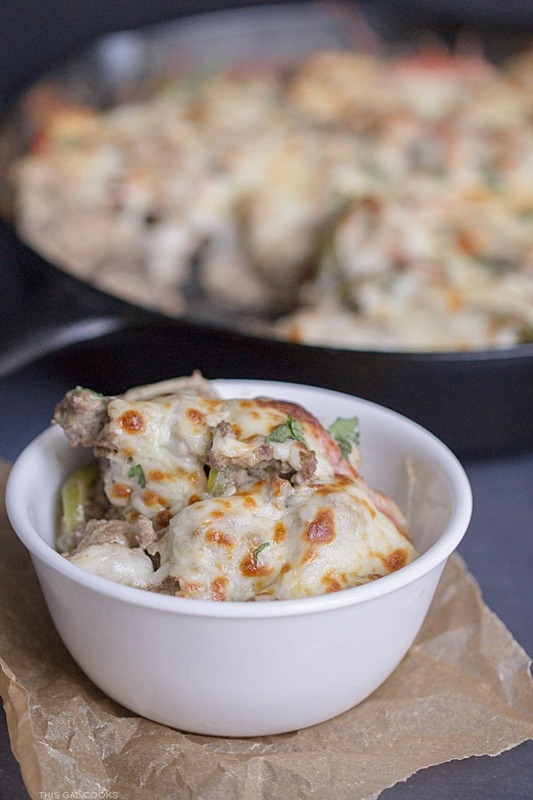 Oh so you want a cheesetastic casserole made with lean ground beef, gnocchi and CHEESE? There’s a recipe for that. And thanks to my wonderful Facebook fans, I’m sharing it with you today. Yesterday I asked my Facebook fans which recipe they would like to see on the blog today. The winner by a landslide – this Philly Cheeseburger Gnocchi Bake. 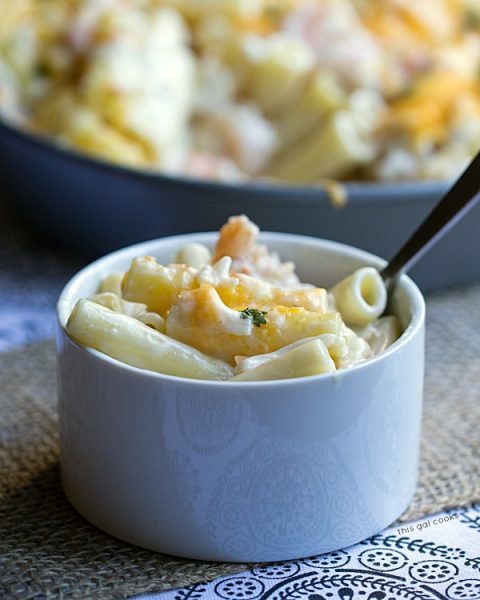 Do you think it was all of that cheesetastic cheese that made this recipe the winner? No joke, this recipe is so super duper easy to make. You’re only gonna dirty up two dishes while prepping this – your skillet and a small bowl for mixing. Be sure to use an oven-safe skillet so you can go from stovetop to oven in a cinch. Can you guess which skillet I used? 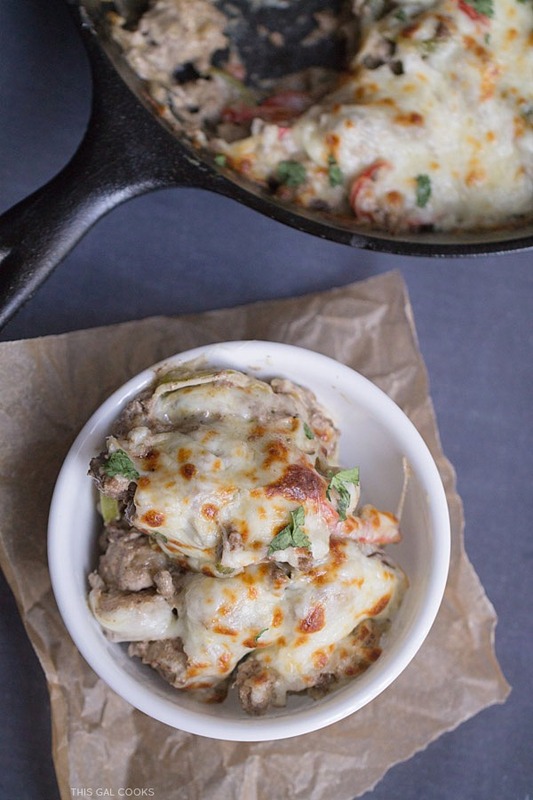 Low fat cream cheese, lean ground beef and whole wheat gnocchi come together to create this quick and easy one pan skillet dinner. In an oven-safe skillet, heat the olive oil. Add the mushrooms, peppers and onions and cook until tender. Remove from the skillet and set aside. Add the beef to the skillet and cook until browned. Drain and return to the skillet. In a small bowl, combine the cream cheese, worcestershire sauce, dijon mustard and seasoned salt. Mix well and then add to the skillet and stir into the beef. Mix in the veggies, and then the gnocchi and then even out the mixture and then sprinkle with the cheese. Bake at 350 for 10 minutes. After baking, turn on the broiler and broil until the cheese is browned. Garnish with cilantro or your favorite herb. This looks so good, Julie! I loved that you used gnocchi in this! And ready in 30 minutes?? YES! :) Pinned & sharing. This looks like I need to add it to the dinner menu ASAP! Yes, you definitely do, Julianne! OK, if I knew there was going to be mushrooms involved, I would have definitely voted in favor of this! 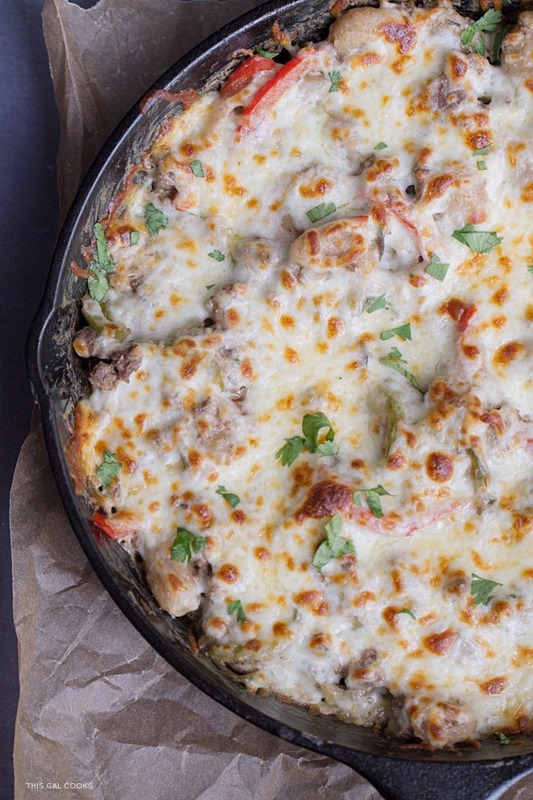 (duh … philly) Creamy, cheesy skillet dinners? Yes please! I hear you on the dairy thing (I’m lactose intolerant) – they always look at you like you are crazy! I’m pretty sure I am lactose intolerant as well! When I cut out dairy or only eat small amounts that have no or low lactose, I don’t get horrible stomach aches. But if I over indulge, I totally pay for it. And yes, they do look at you like you are crazy!!! Please pass me a fork so I can dig right in! 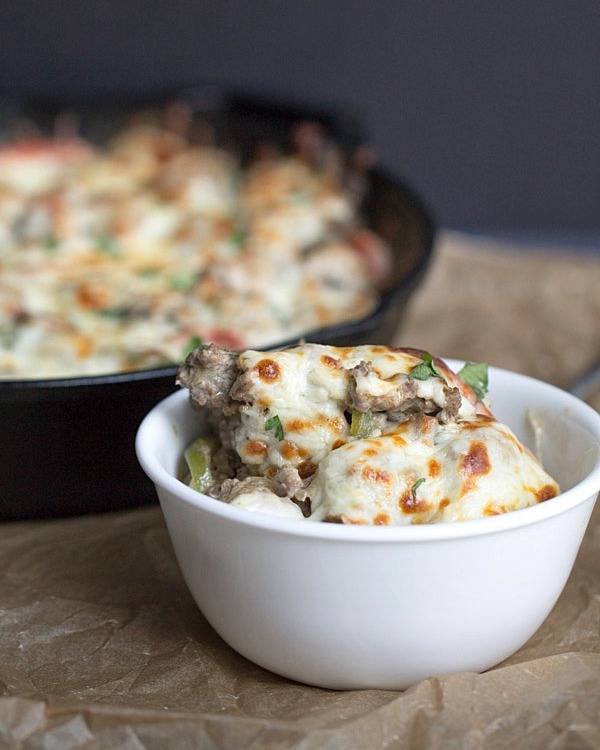 All that cheese piled on top of the gnocchi, beef and veggies is perfection! 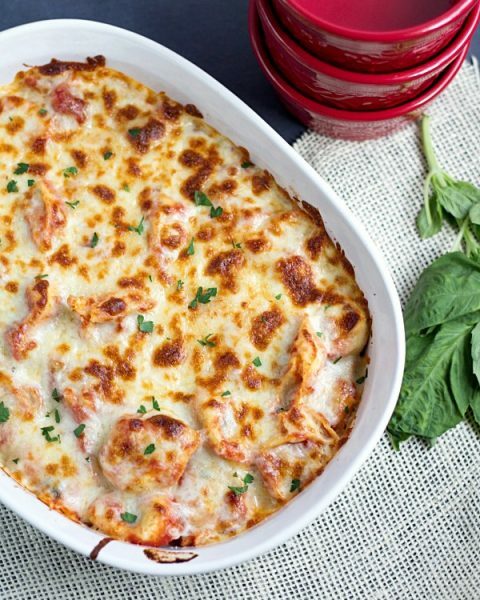 This looks like a very delicious comfort food! Oh yeah, totally comfort food! What a great dish – I loved that you used gnocchi in this! 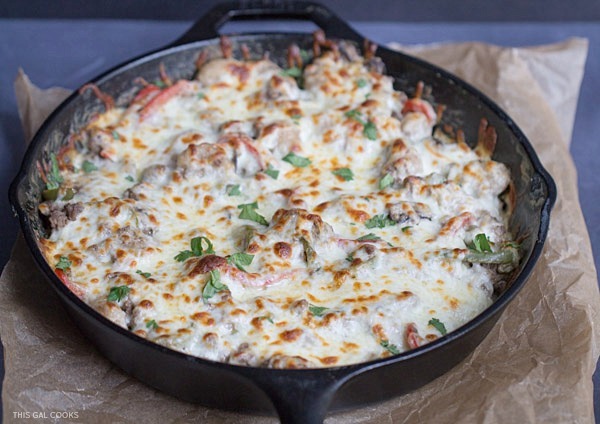 It looks fabulous with all the gooey cheese and ready in 30 minutes too? Sounds perfect – sign me up! I’m new to using gnocchi, so forgive me if I appear ignorant, but I’ve been reading over the directions for the recipe trying to figure out where the meat mixture meets up with the gnocchi. Is the meat mixture served over the top of the gnocchi after it comes out of the oven? Is the gnocchi on the bottom of the meat mixture or mixed in? Do you recommend fresh or frozen gnocchi? Somehow I missed adding that step to the recipe when I was entering it into my post. You would mix in the gnocchi after you add in the veggies to the mixture. I have updated the steps so you will see it reflected there. I’ve never used frozen gnocchi. I purchased the packaged whole wheat variety that was located on the pasta isle in my grocery store.